Tag Archive | "Puntius Conchonius"
The Rosy Barb (Puntius conchonius) is one of the larger Barbs that in their natural habitat grow up to 6 inches in length. The male is red and gold with black spots near the rear and at the dorsal fin. Their colors become bolder during the mating period. 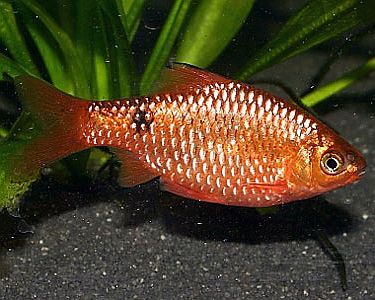 Female Rosy Barbs lack the red coloration and are mostly gold. Females do not have any black color in their fins as males do. Rosy Barbs prefer soft, slightly acidic water and a densly planted tank of at least a 30 gallon capacity. Driftwood and rocks can be added to tank, but be sure to allow plenty of room for the fish to swim. In nature, Rosy Barbs are a school fish and prefer being with others of their own kind in larger groups. Rosy Barbs are semi aggressive in an aquarium environment, but when they are placed in a large enough school, they will usually keep to themselves and not bother any other fish in the tank. Under these conditions, the rosy barb is an active, peaceful species, well suited for community aquariums. 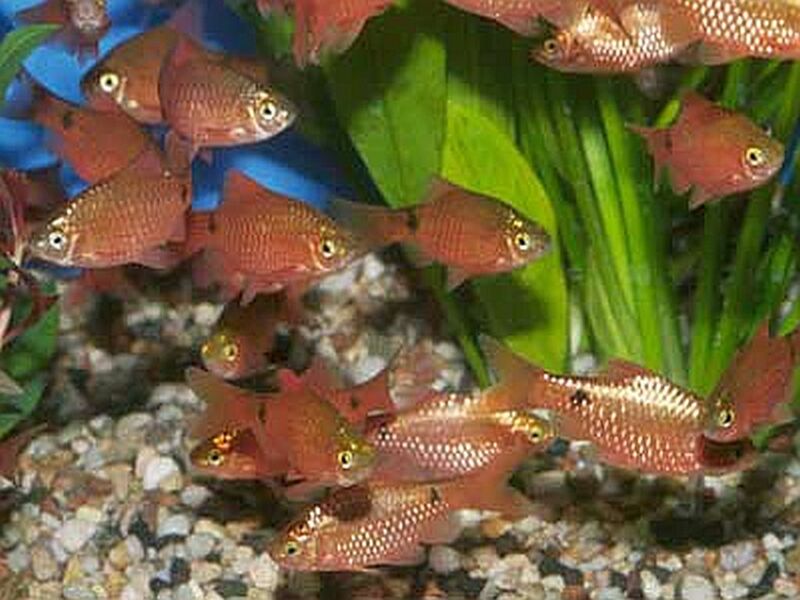 Breeding Rosy Barbs is relatively easy. Place two females with one male in a breeding tank with coarse gravel on the bottom. Spawning usually occurs in the early morning hours and lasts several hours. During this time several hundred eggs are deposited. After the eggs have been laid and fertilized, immediately remove the parents to another tank or they will eat their eggs. The fry will hatch out in approximately 24 to 36 hours. In about six days the young will be free swimming and can be fed newly hatched brine shrimp until they are large enough to eat crushed flake foods. Rosy Barbs are omnivorous and should be fed a variety of foods. Meaty foods like frine shrimp and bloodworms, vegetables, flake foods, freeze dried and frozen foods will all be greedily accepted. Most aquarists feed them a quality flake food with an occasional suppliment of tubifex or bloodworms to their diet. Rosy Barbs are usually purchased when they are about 1-1/4″ to 2″ long but since they grow as large as 6″ in length, they should be housed in an aquarium of at least 30 gallons. A 55 gallon tank would be more suitable.